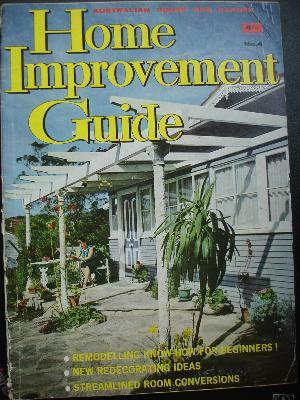 This magazine is titled - Australian House & Garden Home Improvement Guide. Issue #4, also noted as #39 in the Practical Planning Series. Measuring 27cm x 19.5cm with 100 pages. Packed full of redecorating ideas and especially useful remodelling know-how for beginners. COND: Edges bumped, some corner creases, slight edge yellowing, else good. This magazine is titled - Better Homes & Gardens Cyclopedia of Decorating Ideas. Part 2. Measuring 27.5cm x 20cm with 32 pages (Page #'s 33 to 64). 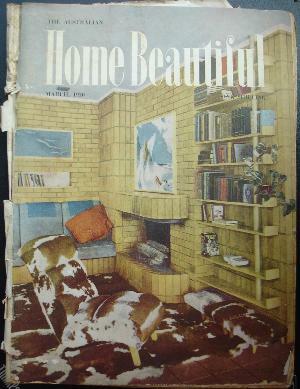 This magazine is titled - The Australian Home Beautiful. Issue dated February 1955. It measures about 27x20cm, with 96 pages. Great info, including Kitchens and gardens. COND: edges worn, cover moth-eaten in areas, pages yellowed on edges. 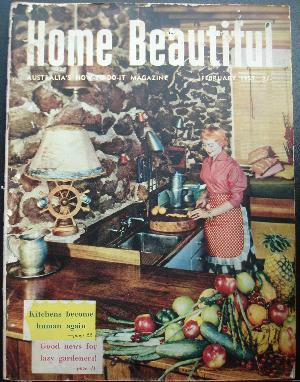 This magazine is titled - The Australian Home Beautiful. Issue dated March 1950. It measures about 27x20cm, with 80 pages. Chock-full of design and decorating ideas from the start of the 1950's. COND: cover spine is rough, edges bumped, some foxing. 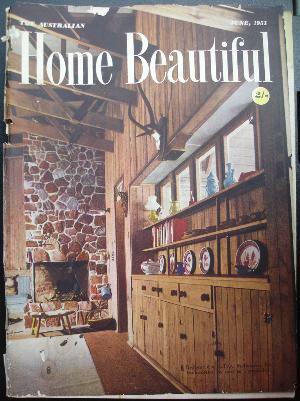 This magazine is titled - The Australian Home Beautiful. Issue dated February 1952. It measures about 27x20cm, with 72 pages. Heaps of indoor and outdoor home decorating and improvement ideas. 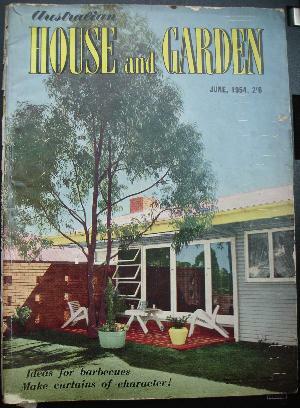 This magazine is titled - Australian House & Garden. Issue dated June 1954. Measuring 30cm x 22.5cm with 84 pages. all sorts of great design ideas, including barbecues (BBQ's) and curtains. COND: edge & spine bumping and wear, pages yellowed, generally good otherwise. 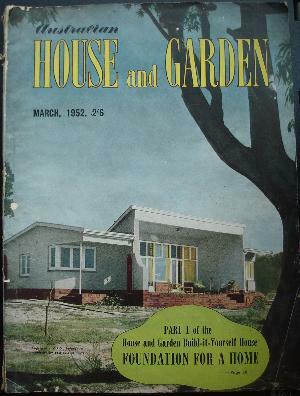 This magazine is titled - Australian House & Garden. Issue dated 1952. Measuring 30cm x 22.5cm with 84 pages. 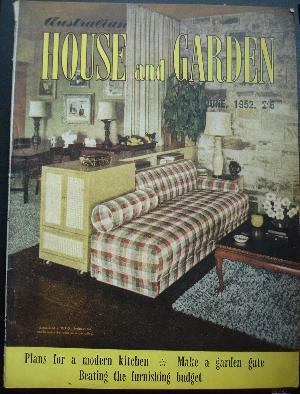 This magazine is titled - Australian House & Garden. Issue dated March 1952. Measuring 30cm x 22.5cm with 84 pages. COND: clean pages, but bumped/worn edges & spine. 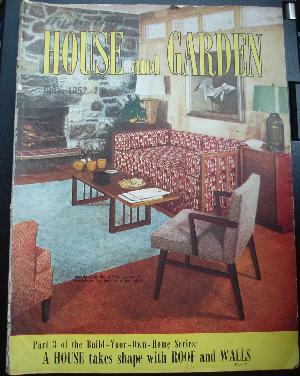 This magazine is titled - Australian House & Garden. Issue dated May 1952. Measuring 30cm x 22.5cm with 84 pages. This issue includes part 3 of the House and garden Build-it-yourself House - The Roof and Walls, as well as heaps of other useful renovating and design ideas. 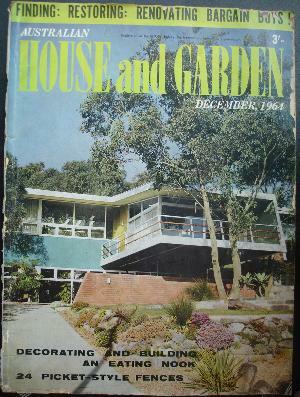 This magazine is titled - Australian House & Garden. Issue dated December 1964. Measuring 30cm x 22.5cm with 108 pages. Heaps of great 1964 design ideas, particularly useful if designing a stage or film set. COND: moth-eaten on front edges, edge wear, mild edge yellowing, else good for age. 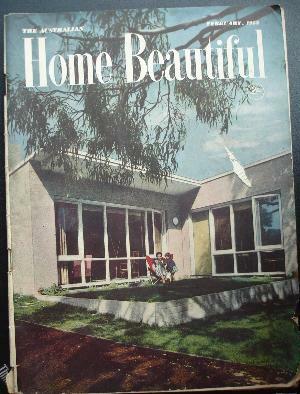 This magazine is titled - The Australian Home Beautiful. Issue dated . It measures about 27x20cm, with 72 pages. Contains lots of great ideas and info from 1951. COND: spine moth-eaten, also some edges. Last updated 8th April 2011.